A couple of days back, we read news stating that the latest iPad mini would be going on sale through T-Mobile’s own retail channels, both online and in store. The initial date given was November 16. Turns out, Tmo changed the release date and is offering it up for sale now. Orders went live from 12:01am Pacific this morning (3:01am Eastern). 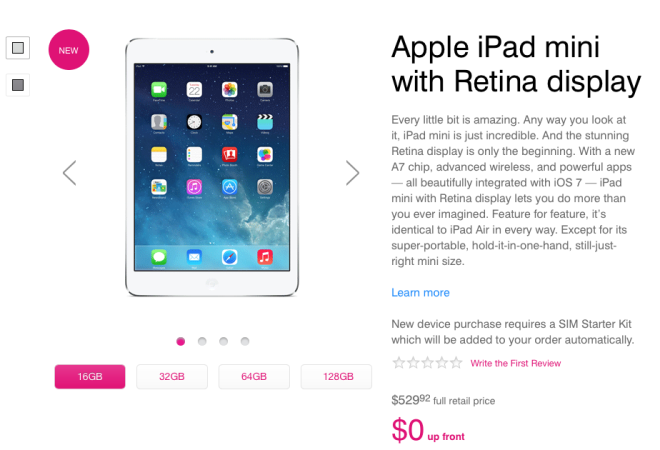 T-Mobile’s initial quantities of iPad mini with Retina display are rather limited. We recommend customers place their order as soon as possible Thursday online at www.t-mobile.com or participating T-Mobile retail stores. Delivery of these devices is on a first-come, first-served basis. We do not have exact details on when we will receive incremental inventory. We will continue to pursue that information and will provide updates as it becomes available. T-Mobile will continue to be transparent with our customers about our services and expected customer delivery of iPad mini with Retina display. Pricing is simple. 16GB model will be $0 down on EIP with 24 monthly payments of $22.08. 32GB and 64GB models will cost $99 or $199 up front respectively, with the same monthly payments as the lowest storage model. The 128GB model, unmentioned on the press release, will also be available for $299 up front. New customers purchasing the tablet will also need to sign up to a paying service agreement with Tmo, whereas existing T-Mobile customers can get the tablet on EIP without needing to sign up for a new data plan. To buy one, head on over to the iPad mini order page on T-Mobile’s website. Just saw that about an hour ago. Not sure if to order the mini Retina or the Air for my daughter for Christmas. Either way getting her another new tablet for X-Mas. Interestingly, the only iPad Mini retina available to me when logged in / adding a line is the 16gb black. No other options. Priority to new customers once again, I guess. Maybe I’ll swing by a T-Mobile store in a bit to verify that they’re not able to order me one there. You could always get one directly from Apple. My local Apple store even has the one I want in stock right now. The draw for buying from T-Mobile is the EIP. My kid gets hand me downs. Its that or nothing for him. He takes the hand me downs. Did anybody order from T-Mobile yet? If so, did they provide a shipping/delivery date after placing the order? Thanks. When placing the order after hitting submit it gives me a window saying “Due to high demand we cannot give you a shipping date”. Did you get that prompt as well? I did order online yesterday. The status is back ordered. I chatted with t mobile rep online. Shipping status will be on the 20th as well ( I guess that is the day that they will ship the item). The expected delivery is Nov 22. Standard delivery time (online order and free shipping ) is 2-4 working days. Hope this helps. So they were basically taking pre-orders for the rMini from the 14th to be shipped out on 20th. Now it’s listed as BackOrdered 6-8 weeks. I have the Air. Fantastic. I picked up the Retina mini. The R mini is a disappointment.The original iPad Mini is 308 Grams. The iPad Mini Retina is 331 Grams. Heavier. It has a blue hue and the iPad Air shows much richer colors and whiter background. The iPad Air overcame all the downsides of ipad 3 and 4, after ipad 2. R mini is similar to iPad 3 – which was heavier and poorer battery life compared to an iPad 2 to iPad 3 evolution. Bottom line – go for Air or stick with ipad 2. If you have the mini, not worth upgrading to the Retina Mini.